The story of Sampo is the most important legend in the Kalevala – the national epic of Karelia and Finland. 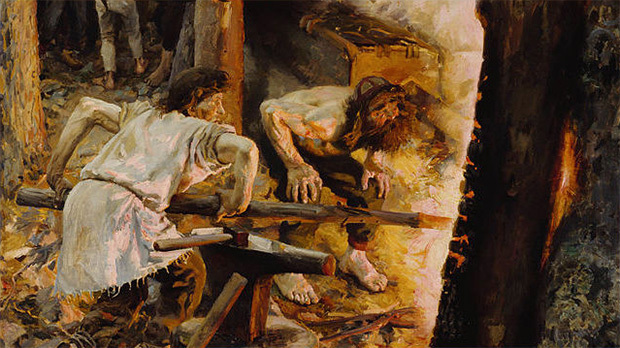 IImarinen, a blacksmith who created the sky, forges the Sampo. The concept of Sampo remains a secret. It is told to be a magical mill or a horn of plenty, which brings prosperity and abundance into our lives. Forging of Sampo, is a 5-step training programme for teams and organizations. It ties together my expertise in team and personal coaching, cultural awareness, performing skills and research into Finnish traditions. The process of transforming raw iron to metal objects creates a solid and clear structure for the training. The programme starts by framing the present situation of your organization. The aim is to find the iron heart and core competence of your team. The training brings these basic components of success into the open. Each stage unfolds the process and reveals new knowledge, new skills and resources. The sparks of success turn into flames and finally the new Sampo – a project, a service or an idea that enriches your team – is created. The length of the training is between 1-5 days. 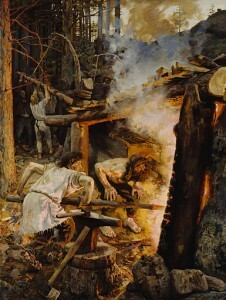 During the presentation you will learn the 5 steps to the Forging of Sampo. You will also get a taste of the basic exercises and techniques used in the training.